Hands on all these Monacos are brushed steel, with luminous inserts, and the hands should be long enough to reach the circular track. Hands on some questionable samples are shorter, made of polished steel, and may not have luminous inserts. Script has considerable detail in certain letters (for example, the "A" in the word Monaco and the "R" in the word Heuer should have small serifs / tails). Refinished / fake dials often lack this fine detail. Style of numerals seems to vary between the genuine dials and some of the questionable ones. Notice different styles of the "4"s (open or closed), and some variations in other numbers. The case-backs of all genuine Monacos are marked "Tool 033", referring to the plastic tool used to open the case. The following photographs illustrate certain variations between these Monacos, so that collectors can distinguish models known to be genuine and those about which there may be some doubt. 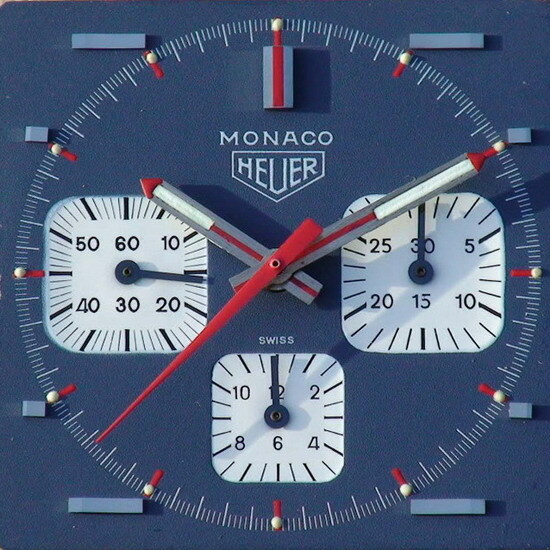 A genuine Monaco -- proper detail in the script ("Heuer" and "Monaco"); brushed steel hands (long and wide, with luminous inserts); correct numerals in the registers (closed "4"s); correct markers, properly placed. A genuine Monaco dial; note that there are no luminous dots on the dial; in many instances, luminous dots may fall off when the case is opened for servicing; here, all the dots have been removed. Questionable sample -- missing detail in the script ("Heuer" and "Monaco"); short, thin hands, perhaps from an Autavia GMT; different style numerals in the registers; applied markers not properly aligned; no luminous dots on the dial. Questionable sample -- missing detail in the script ("Heuer" and "Monaco"); short, thin hands with minimal inserts; different style numerals in the registers; applied markers not properly aligned. Proper marking on the case-back -- Tool 033, a reference to the tool that is used to open the case.